Landscape oil painting by Chanin. 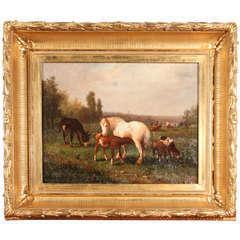 American landscape with animals, unsigned. The measurements below are with the frame without the frame the measurements are: 21.5" W x 17" H.
Painting by G. Renouf "Uniforme" Signed bottom right and the back of the art. Dated September, 1977. Untitled by Jorge Santos is mixed-media on canvas. Singed in the bottom right corner and the back. Abstract painting signed V. Adams. Acrylic on canvas. Undated. Only provenance is that it came from a DC collection which focused on 19th century landscapes of fine quality. 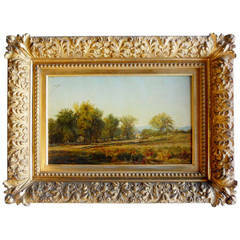 Wonderful snowy landscape in a Fredrick Harrer type frame. Beautiful and serene original watercolor by Nicolai Cikovsky. Image size is 14" by 20". Oil on board Signed in Mono (dated 96') Framed Measures: 4.5 x 7 inches (11.5 x 14 inches framed).